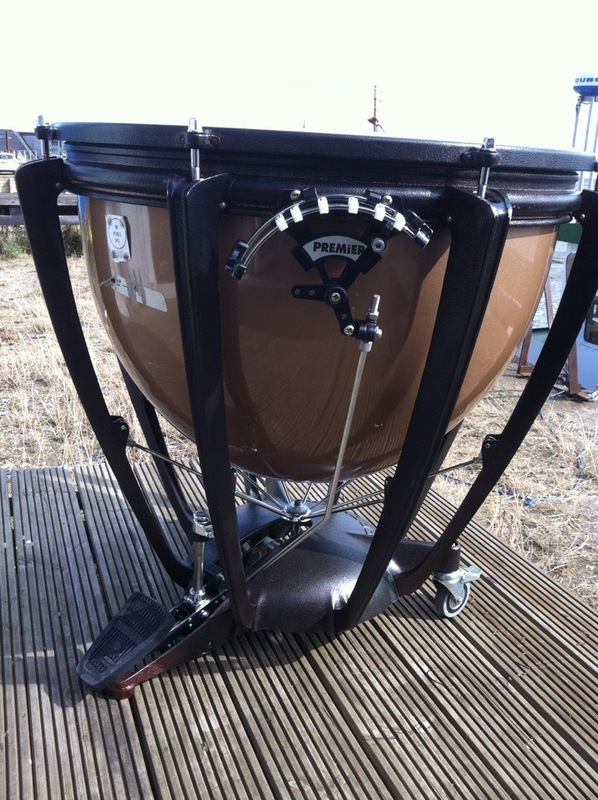 A set of 3 Premier fibreglass concert timpani to be over hauled. The usual problem with Premiers – the bowl shifts in the chassis. This is a bad example where the bowl is actually being pulled into the inside of the suspension hoop. These types of issues will affect the tonality across the playing range but one part of the range may well be in tune. Cleaning of the old, incorrect, counter hoop felt and glue residues ready to be replaced correctly. First the hoops will be checked for loose parts and that they are flat and round. After final clean, new felt will be inserted. The counterhoop is like the nut on a string instrument, bad implementation will create a vagueness in the note. The variation in tension has created a wiggly edge to the nodal point. This creates problems when putting on a head and clearing it (removing overtones). The distortion can be minimised, but I have yet to definitively solve the problem, only achieving up to 1/2mm out of flat depending on where the hoop has bent. 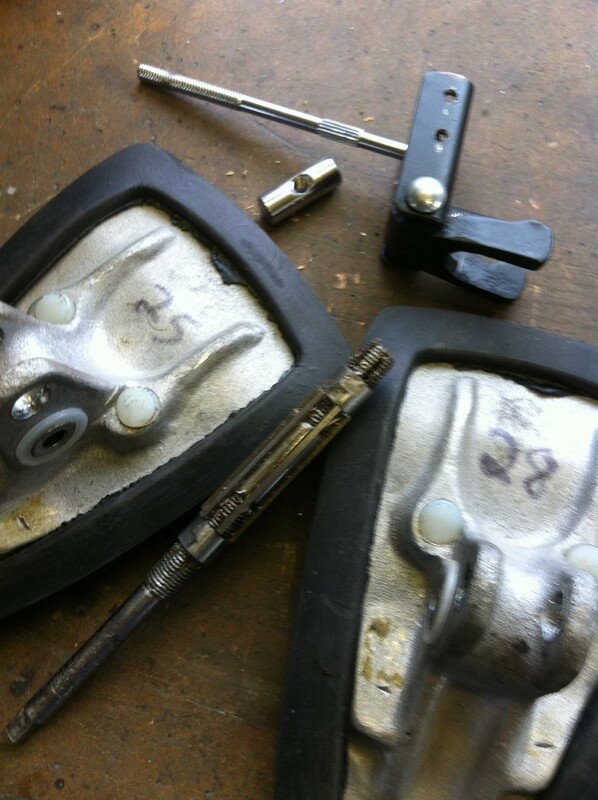 Pedal casting dressed & nylon inserts reamed so that the pedal fulcrum spacer can be gripped firmly between the pedal arms without inhibiting the pedal movement. The fork pressing cleaned, lubricated and the fork casting dressed to ensure squeak free smooth operation. The adjustment screw barrel nut tapped, de-burred and lubricated to ensure easy adjustment and smooth movement. All three elements allow the pedal to operate without resistance; the pedal return pressure is provided by one spring inside the clutch mechanism. 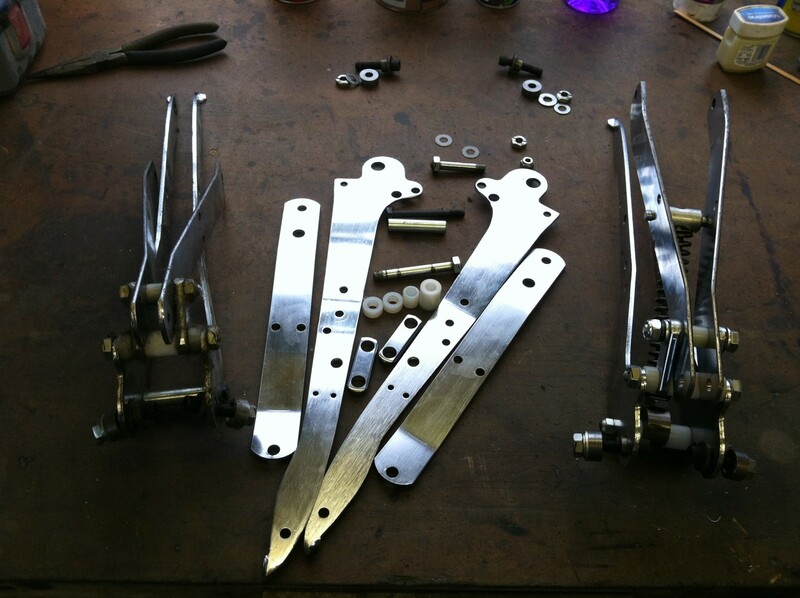 All the work here is aimed at making the pedal operation smooth and resistance free, and to enable the whole assembly to be stiffened. Therefore decreasing friction in the vertical operating movement whilst minimising horizontal play. My aim is to improve feeling whilst playing, assist the function of the clutch mechanism and facilitate greater accuracy in instrument set up which in turn improves quality of tone. New aluminium shoes have been welded onto the foot of the base casting, and now the chassis are ready to be cleaned and painted. 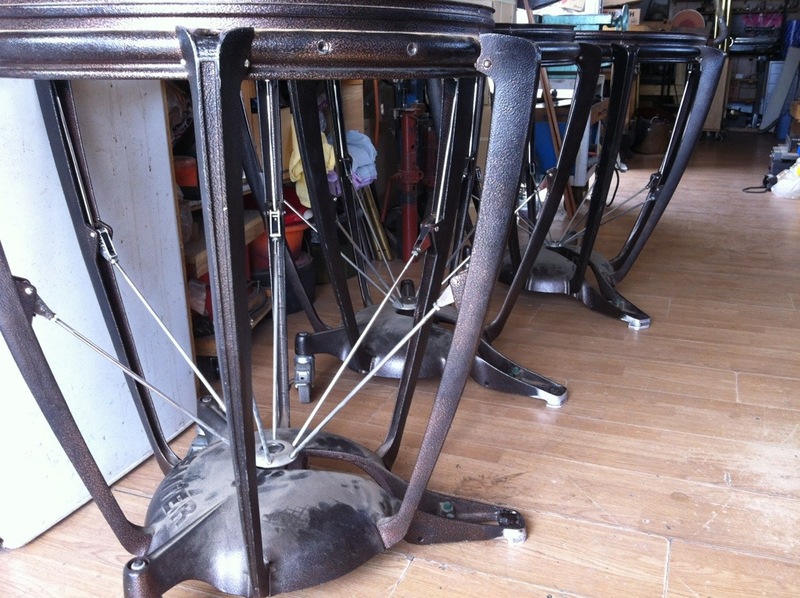 As the drums are moved, the casting wears down which lowers the front to the point where the pedal mechanism fouls the floor. Screwing on a plastic pad is a temporary fix, but the problem is that the force applied to the pad is shear, and that is the weakest aspect of a screw. Once the screw has snapped, your left with removing hard steel from soft aluminium. After the chassis have been worked on, and the set up done, everything is ready for reassembly. Thanks so much for your insights and wisdom! Can I ask, in your experience does this issue of a shifting kettle happen only with fibreglass bowls or does it occur with copper bowls as well? I have a 40 year old pair of Premier timps and I cannot get the head in tune with itself, and the tuning around the drum at the lugs seems to change as I move from bottom to the top range of the drum. 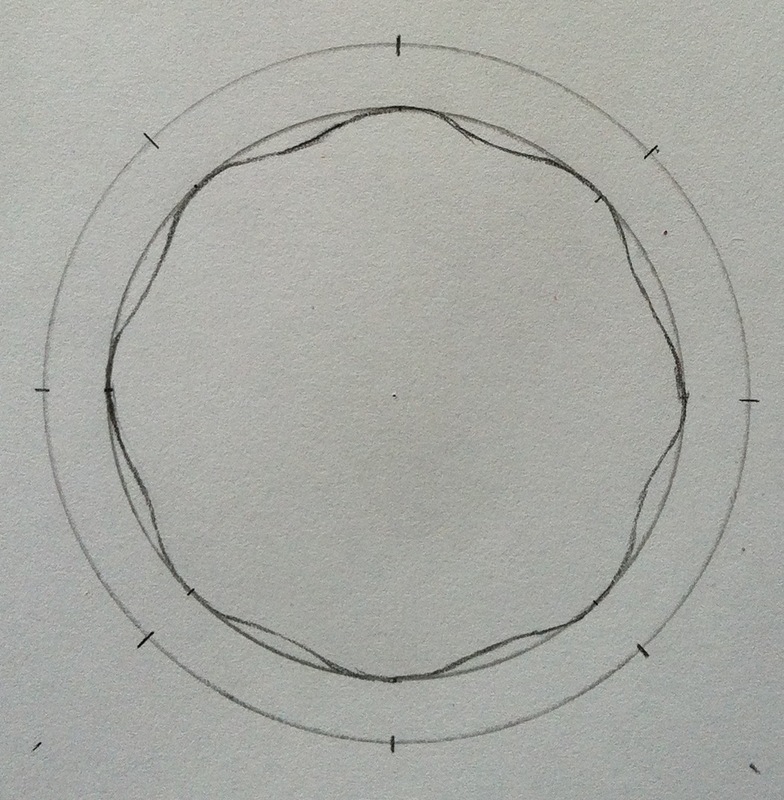 Could this also be related to the age and trueness of the hoop? Or perhaps I just need new felt? How old are the heads? Do the drums get moved around a lot, and if so how? 40 years would make them series 3? I would need a photo of a tuning bolt and strut and another of the underside. The bowl shifting in the hoop is a Premier problem, nothing to do with the bowl material, more to do with cost cutting measures and the density of the felt that they use – the felt being too soft. You wrote, “Or perhaps I just need new felt?” There is no “just need” this or that with timpani. It is a musical instrument, Premier informed me that it has over 200 moving parts. The quality of musical instruments regardless of whether it is a fiddle or a bass drum is down to no one component, rather it is the cumulative effect of each component being optimized. Therefore the primary reason for your tuning issues could indeed be the hoops but there are a myriad of other things that it could be.